UPDATE [ October 20th, 2018 ]: Here is a video guide specially made for Analytify WordPress Plugin users. 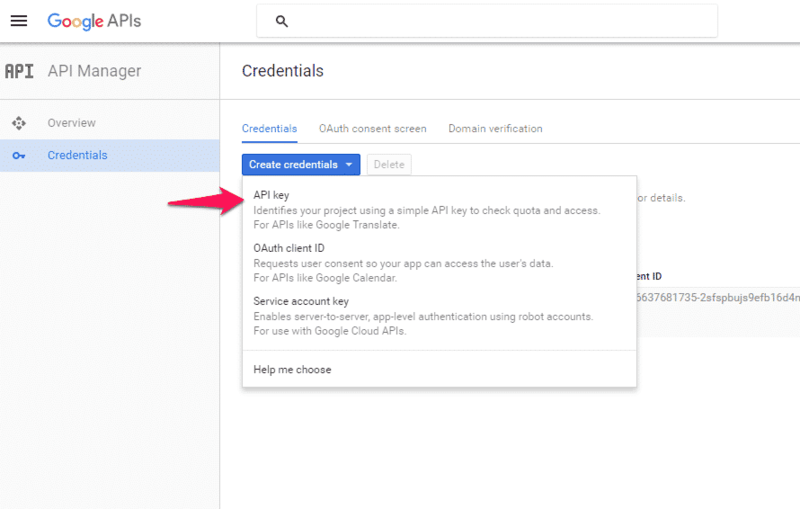 Following are the simple steps which can help you to get your Client ID, Client Secret and Developer API Key for your Web Apps or WordPress plugins from Google Developers Console. We wrote this tutorial for Analytify users but It can be beneficial for everyone. You need to create a Project in Google Developer Console. Click here to go to Console page. It will ask you to login with your Google Account if you are not logged in already. If you have already created Projects in Google Developers Console, you will see the list of created projects. If not, following screen will appear. In both scenarios, Click on ‘Create Project' button. A page will redirect, where you will enter ‘Project Name' and ‘Project ID' which will help you to recognize your project in the console. By clicking on Create button, Your project will be created and redirects you to your projects list in Console. Go to the Dashboard from menu navigation > APIs & Services > Dashboard from the left corner icon. Clicking on the project name which you have recently created will take you to your Project Dashboard. Now you need to select a Library. Go to Library page from navigation menu > APIs & Services > Library from the left corner icon. 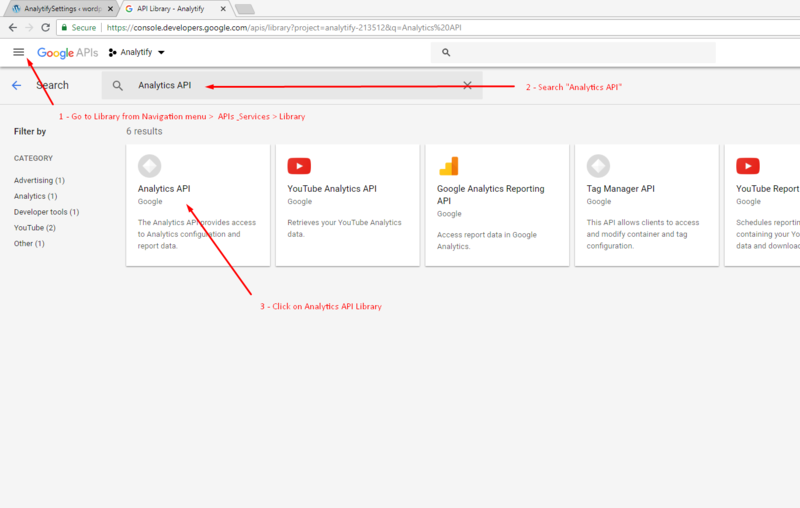 Search Analytics API library, Select & Enable it. Next, Go to Credentials -> OAuth Consent Screen tab, Check your Email address and Enter your Product name “Analytify” and Save it. After Saving, you will be redirected to Credentials tab. Here you will see a popup from where you select an OAuth client ID option under Create credentials select box. Here you will select your Application Type ‘Web application'. Name of the client and add the Authorized redirect URIs. Redirect URI must the same of your application installation URL. 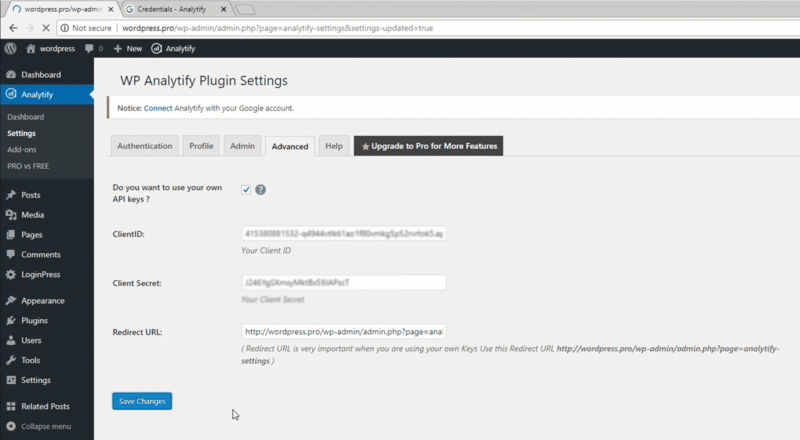 For Analytify WordPress plugin, you will get it from Analytify > Settings > Advanced tab. Here you need to enable the “Do you want to use your own API keys?” option and get the Redirect URL. Copy the URL and paste it in Authorized redirect URI and click on create button. 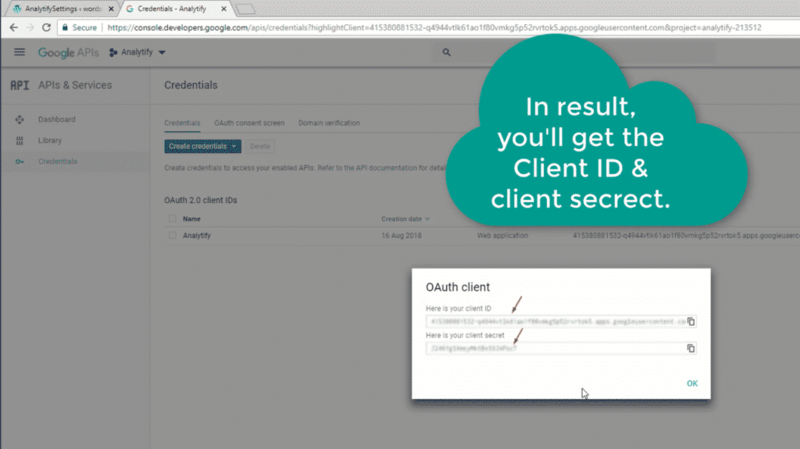 In result, you'll get the Client ID and Client Secret. Copy that and paste these in your plugin settings. 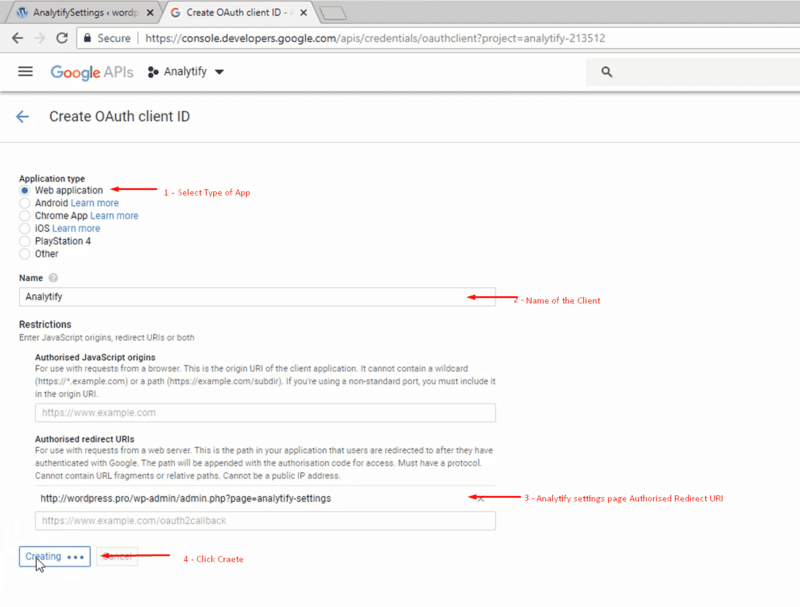 Get your Client ID and Client Secret – Google Developers Console. Paste Client ID and Client Secret in plugin settings – Google Developers Console. After pasting the Client ID, Client Secret and Redirect URL in plugin settings, save the settings and Login with your Google Analytics Account to connect with Analytify. Next, you need to choose your profile from Analytify > Settings > Profile tab. Choose a profile and save it. Woohoo! Here you ready to view your Google Analytics in WordPress/Analytify dashboard. Note: Analytify doesn't need API Key anymore after a version 2.0.0 but if you need an API Key for another project you can get it from Credentials tab. Click on API key at the dropdown like below. How to use Google Analytics for your clients ? I am asked to enter my API keys BUT there is nowhere to enter those keys! I’ve been going around in circles for 30 minutes. What am I doing wrong??? Hey, you are Premium Customer right ?? You don’t need to enter Keys. Just authenticate and paste the Access code and it should work. Check this video for Premium customers. I just installed the plugin and it looks really great. But I miss the click route people have. Where can I see on a page where people came from and what page they went to after this particular page or post? I can’t find it in the overview. You should update this tutorial. Google has changed its layout and your instructions do not reflect the actual page. I am getting a 401 error when requesting “Get your access code”. Yes, I saw that and have update this tutorial. Let me know If it helps ? I am still getting this 401 message! What am I doing wrong? I created oauth for installed application i.e., android correctly, but when i downloaded json file in that client secret key is missing.How do i find it, is google changed their policy? Pls help me to find client secret key. In recent update to WP Analytify, You don’t need access code. Simply login with your Google account and you will be connect. Update your WP Analytify please. Ok, thanks. How do I update it Adnan! Just to let you know, that when I t to get short url from inside my blog, it went error, and then I couldn’t access my pages, so had to deactivate the plugin! So hope the updated version works. This what I get. Please advise. Thanks! You are talking about Shortify not WP Analytify. Will get onto the correct product and try again! “client_secrets.json” file actually contains the Keys. You will generate this file from the developers console. Redirect URI is your plugin’s settings page. Where can i Get Redirect URI? I can’t find Redirect URI, plz help me..
After I configure my own API key, when I try to login with google analytics account I get 403 Forbidden error. After I configure my own analytics API key in the plugin when I try to login to my google analytics account I get 403 forbidden error. I’m getting a similar issue to Mohammad. When I try to authenticate with my own API, it connects to Google, but once I click allow it redirects me back to a 404 page on my site instead of the analytify authentication page.